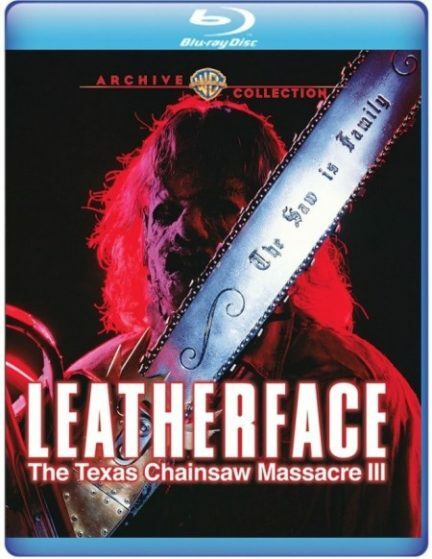 Leatherface: Texas Chainsaw Massacre III was directed in 1990 by the master of the horror sequel Jeff Burr (Stepfather II, Pumpkinhead II: Blood Wings, Puppet Master 4/5, From a Whisper to a Scream, & Night of the Scarecrow). 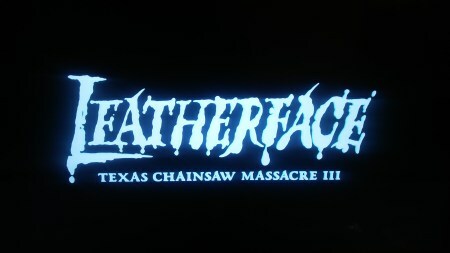 It was the 2nd sequel in the beloved Texas Chainsaw Massacre/Leatherface universe. It was the first TCM film not directed by horror legend Tobe Hooper. It was also the first TCM film that wasn’t shot in Texas, it was filmed in California. 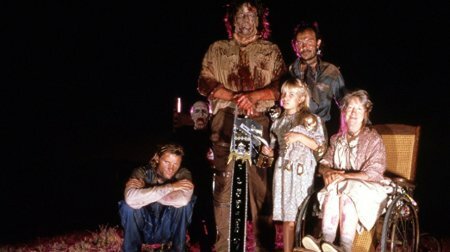 It was the first Texas Chainsaw film to feature a completely different family. After the first two entries in this dark world became a success, rising studio New Line Cinema aKa the house that Freddy built decided to take a chance on this franchise purchasing the rights from the infamous Cannon Group & they were hoping to bring it to the next level! Originally, they contacted Peter Jackson who was getting lots of notice at the time to direct this. Obviously nothing ever happened between those negotiations but later on he would do films that made New Line a major studio in Hollywood. New Line was heavily involved with the production of this film unlike the previous two. This lead to the script being changed, it was originally more violent & featured additional explicit gore sequences. After test screenings, a re-shoot took place which included a different ending from what was planned & filmed. Burr was fired & re-hired towards the end of making this. 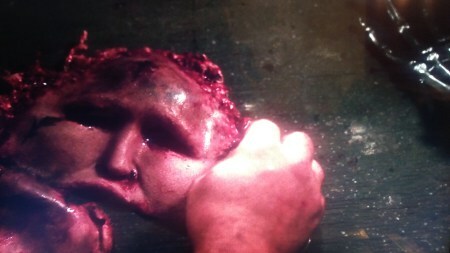 Most of the gore, deaths, & suspenseful scenes were trimmed. It was the final film to receive an X rating before it was replaced with with NC-17. It was submitted to the MPAA 11 different times trying to get a R Rating which was a record at the time. That caused TCM 3’s release date to be delayed & pushed back. It was #11 at the Box Office during it’s opening week & failed to be a success after all the previous issues. Jeff Burr didn’t have any contact with New Line until 2003 over this disastrous production. 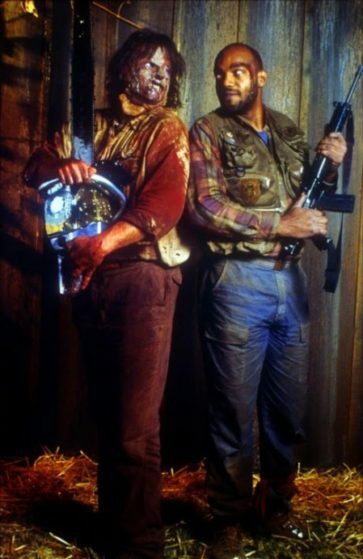 Horror Icon Kane Hodder was the stunt coordinator on Leatherface: Texas Chainsaw Massacre III & he was also the stunt double for the main character during some scenes. He also played Leatherface in the AMAZING promotional trailer for this sequel. Original Leatherface actor Gunnar Hansen was the first one to be offered the role but turned it down due to not coming to an agreement on pay. The chainsaw in the movie weighed approximately 80 pounds. Caroline Williams from Part 2 has a cameo as a reporter. The house from this movie was also used in Alice Cooper’s “House of Fire” music video. Luckily, part 3 got a NEW life with home video & finally got a proper release that wasn’t butchered & censored!!!! The film opens with Junior (played by: R.A. Mihailoff from “Trancers III”, “Pumpkinhead II: Blood Wings”, “Hatchet II”, & “Death House) aKa Leatherface (He’s never referenced as that name in the feature) messing with human flesh trying to make a new face for himself. You are introduced to a bickering couple Michelle (played by: Kate Hodge from “Tales from the Crypt”, “The Hidden II”, & “Rapid Fire”) & Ryan (played by: William Butler from “Friday the 13th Part VII: The New Blood”, “Ghoulies II”, “Night of the Living Dead”, & “Arena”) from California on a road trip delivering a car to Michelle’s father in Florida. They hit a traffic stop where over 60 to 70 remains were discovered. 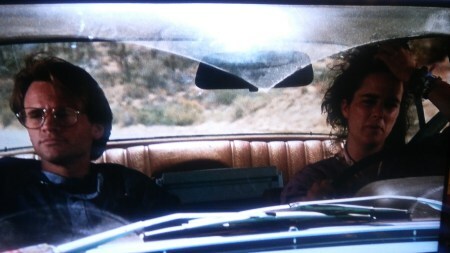 They stop at the Last Chance gas station, they run into drifter Tex (played by: Viggo Mortensen from “Prison”, “The Indian Runner”, “Carlito’s Way”, “The Prophecy”, & “Psycho”) & local weirdo Alfredo (played by: Tom Everett from “Friday the 13th: The Final Chapter”, “Prison”, “Death Wish 4: The Crackdown”, & “Best of the Best”). Tex & Alfredo get into it over the perverted Alfredo spying on Michelle in the restroom. Shots are fired & the couple drive off in a hurry. Ryan decides to take Tex’s advice & takes an unknown shortcut that’s not on the map. They are chased by a truck & the car gets damaged. They confronted by a psychopath with a chainsaw. They barely escape & after a quick fix that doesn’t hold long they end up crashing into Benny (played by: Ken Foree from “Dawn of the Dead”, “From Beyond”, The Dentist”, “Halloween”, & “The Devil’s Rejects”). They tell him that they are being hunted. He doesn’t seem to believe them until he becomes a witness of this chaos. 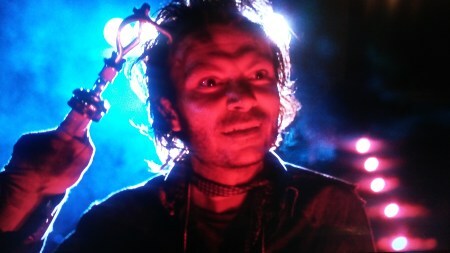 Benny sees a stranger Tinker (played by: Joe Unger from “A Nightmare on Elm Street”, “Barfly”, “Road House”, & “Pumpkinhead II: Blood Wings”) with a tow truck. After a conversation he knows something isn’t right but Tinker tries to kill him before he can do anything. Junior & Benny start fighting but Leatherface gets distracted by a victim (Toni Hudson) that escaped earlier in the woods. Junior finally catches up with the girl & gets to finish what he originally started with her. Ryan runs into a trap & injures himself leaving Michelle to go off on her own. Ryan is helpless & gets MUTILATED by the unstoppable monster. Michelle find a house near by & she’s hoping to find some help. She sees a little girl (played by: Jennifer Bank from “Friday the 13th Part VII: The New Blood” & “Barb Wire”)” in there. She gets stabbed by her then captured by the rest of the cannibalistic family which includes Grandpa & Mama (played by: Miriam Byrd-Nethery from “From a Whisper to a Scream” & “Stepfather II”). She gets to spend quality time with the demented clan & gets tortured by them for their own entertainment. 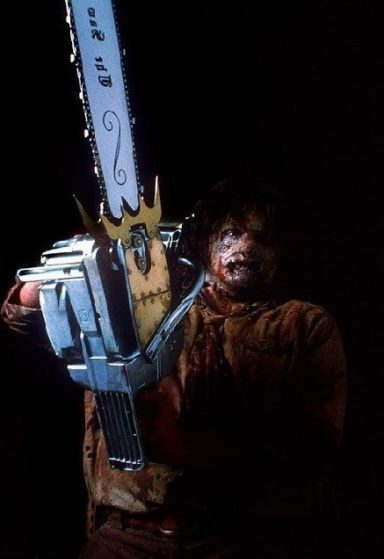 Junior gets a new gift, a custom made massive chainsaw. Benny tracks down Alfredo in the woods & knocks him out. The family puts Ryan out of his misery in front of Michelle. Benny shows up & shoots at the house & damages various family members. This was done for possible sequels that unfortunately never happened. It makes you wonder what happened to a few of them. 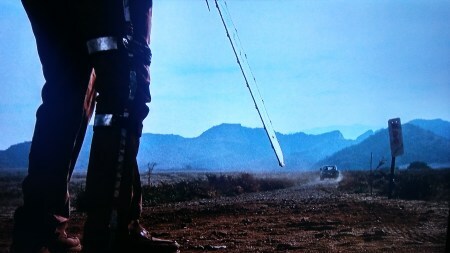 Tex goes after Benny which leads to his gruesome demise. Michelle, Benny, & Junior are fighting in the woods. It appears that Junior has killed Benny (In any other movie, it wouldn’t be a question! Must have had limited funds on those re-shoots LOL). Michelle loses her mind & beats Junior unconscious. She’s lost & looking for help when the Last Chance truck arrives. It’s Benny who somehow survived that brutal attack in the woods. They get a surprise visitor but he underestimates Michelle. After the two heroes leave, you see there’s still someone waiting for REVENGE! I’ve seen this film in almost every format that it’s been released which includes at the Drive In, VHS, DVD, & now this beautiful high def presentation on Blu Ray! As far as I know, the only format I haven’t seen it on was Laserdisc. So after countless viewing experiences I can confirm that this is the BEST that Leatherface: Texas Chainsaw Massacre III has ever looked! I would HIGHLY recommend upgrading any other copy you own of this. Jeff Burr had some additional/unreleased special features for this release but unfortunately they weren’t used but Warner Archive listened to all the fans & made sure they released TCM III UNCUT like it was meant to be! Also, the audio plus the heavy metal soundtrack/score sounds GREAT & destroys all previous versions. W.A.C included previous extras that were on the New Line DVD. Jeff Burr is one of the most informative filmmakers you can listen to when it comes to Audio Commentaries. He is joined by David J.Schow, Greg Nicotero, Mark Droesky, William Butler, & R.A. Mihailoff. Honestly, this is one of my favorites when it comes to commentaries. It’s VERY fun & entertaining plus you leave with plenty of information/stories. The Saw is Family: Making Leatherface is a 28 minute featurette that discusses the pre-production, filming, & the history of TCM 3 with various cast/crew members. We Know What to Do with Them Parts: Deleted Scenes documentary runs almost 10 minutes. It features extended/lost scenes with discussions from the crew. It also includes the infamous Alternate Ending that is a little over 5 minutes. It definitely puts a different spin on things.